Yesterday saw the release of Kingdom Hearts 1.5 HD Remix in Japan. And as I plunged into the graphically remastered Disney/Square-Enix crossover, I couldn't help but think about the one thing the franchise needs more than anything else: more Scrooge McDuck. 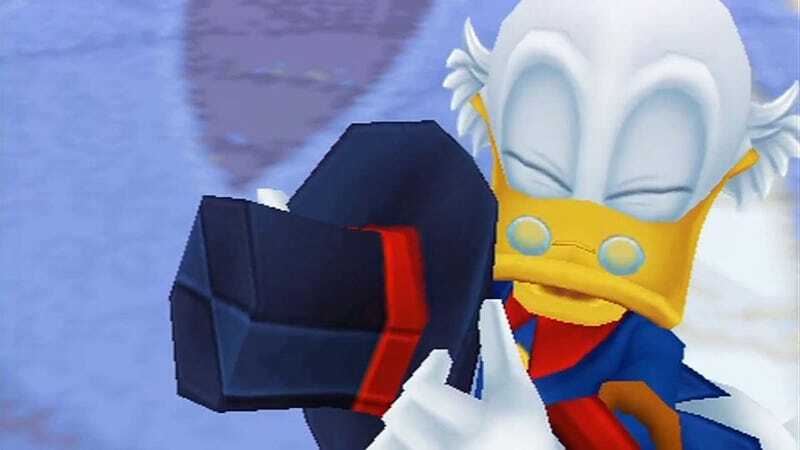 The richest duck in the world is no stranger to the Kingdom Hearts series. His first appearance was back in Kingdom Hearts II as a minor side character where he is attempting to set up an ice cream shop and recreate the lost "sea-salt" ice cream flavor—and reap the monetary benefits, of course. In the prequel game, Kingdom Hearts: Birth by Sleep, he had an expanded role where he unlocks one of the subsequent worlds for the player characters. He also threatens a giant monster with his cane. While unvoiced in his first appearance, he was voiced by Scrooge's longtime voice actor Alan Young in BBS—which pretty much makes Birth by Sleep the best game in the series by default. Best of all is his backstory in the Kingdom Hearts multiverse. Not content with simply being the richest Duck in one world, Scrooge sets out to travel to the Disney worlds, set up a transit system between those worlds, and to create a multiworld business empire. His story is DuckTales meets Sliders. Now that is a Kingdom Hearts game I would play: Scrooge McDuck, going from Disney world to Disney world, gaining mythical treasures and beating villains with his clever mind and hard wooden cane. After all, it worked pretty well on the global scale. But what is it about an elderly cartoon duck that so tickles my nostalgic yearnings and those of so many like me. To explain my strong feelings toward Scrooge McDuck, we must look toward the mythical time known only as "the 80s."